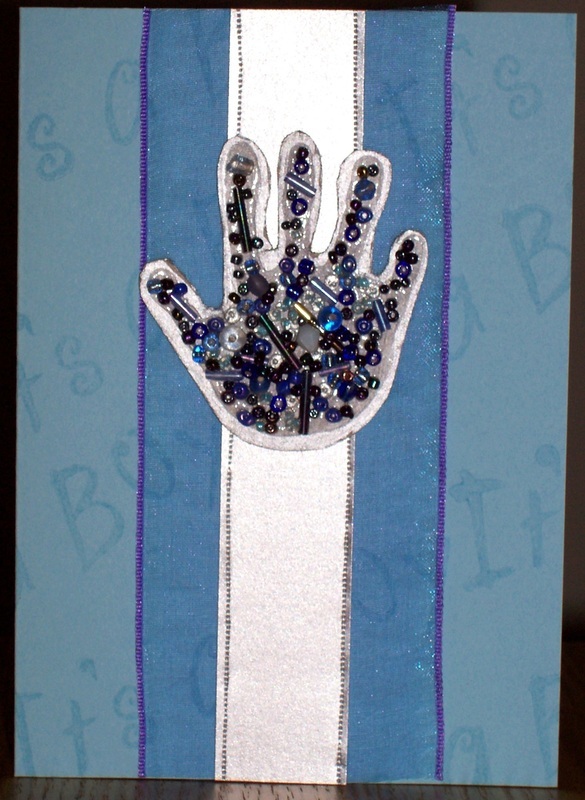 Make a Baby Card with a beaded hand on the front. These gorgeous cards to welcome a new baby can be made in any colour you choose. 2. Strip of silver card measuring approx 3cm wide and 17cm long. 4. Piece of card measuring 21cm x 15 cm (ie a piece of A4 halved). Scored and folded to make a standard size card. Colour of your choice - matching your colour scheme. 5. A piece of thick card approx 10cm x 10 cm. You need to be able to cut the card with scissors. I used card I recycled from the back of a writing pad. 1. 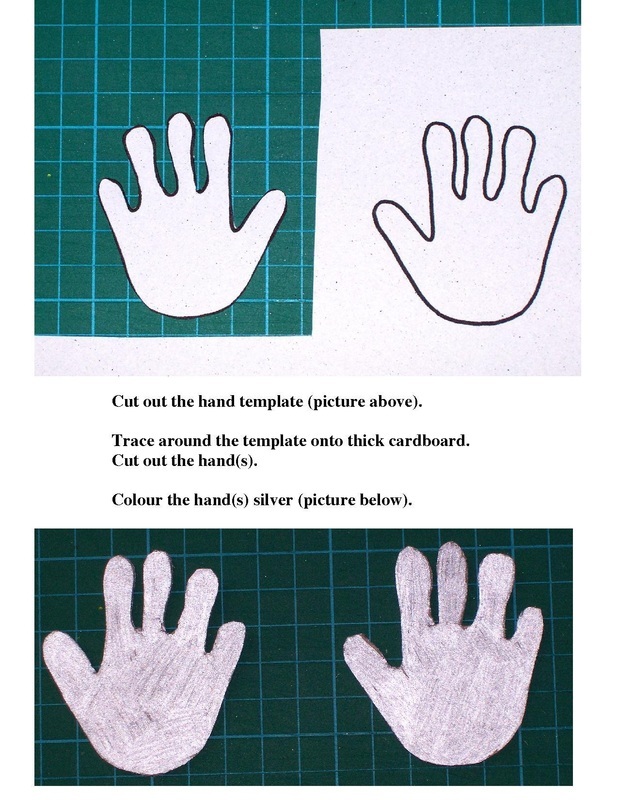 Print out the hand template onto a piece of light card. To print the Template - open the pdf (below) or jpg image (right), and print. 2. Cut out a baby hand. 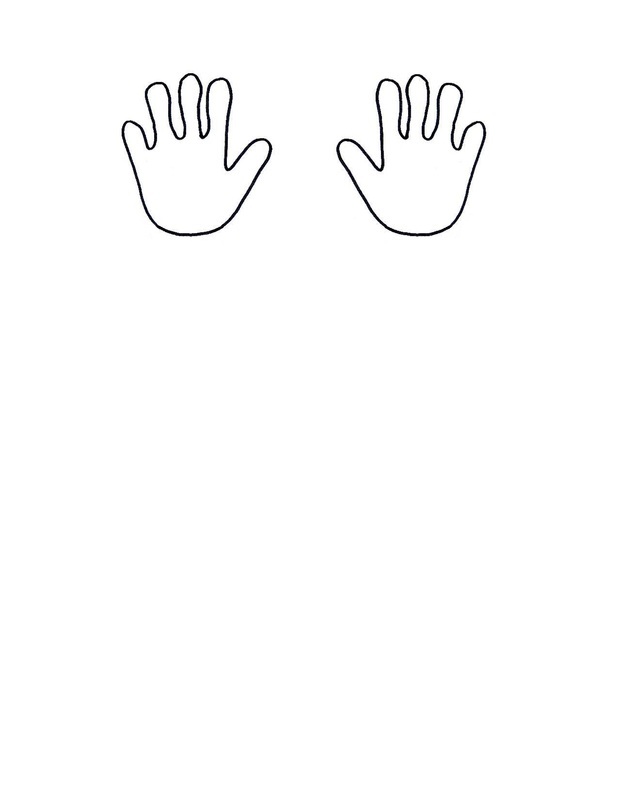 Trace around the hand template onto the piece of thick white card. 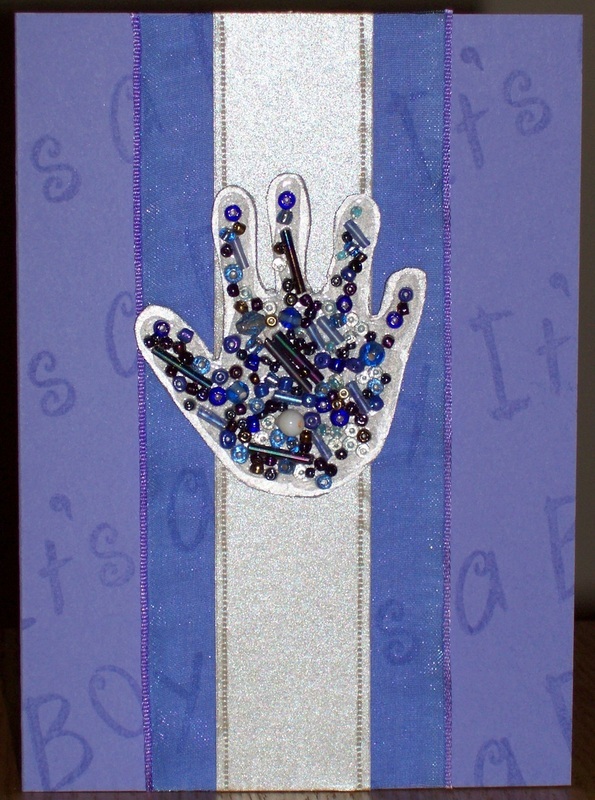 Cut out the hand, using a craft knife and then colour the top side of it completely with the silver paint pen. Don't forget to do the side edges of the hand. Depending on which way over you turn the hand to paint you will get a left or right hand for your card. 3. Lay the hand on a piece of scrap paper and cover it almost to the edges with a layer of PVA glue. Arrange your chosen beads onto the glue. Once you are happy, put it aside to dry. A random arrangement of a few types of beads that differ in shades of colour (but within one colour scheme), style, shape and size look best. However, make sure that there are several of each type of bead onthe hand. Also make sure that the hand is covered, and that no large gaps are left. You may include clear, silver or white beads in any colour scheme. 4. While the glue is drying, get the rest of the card ready. Firstly, using the versamark ink pad, randomly stamp your chosen background stamp over the front of the card. Place the card on a piece of scrap paper, so that you can stamp over the edges for a more complete look. 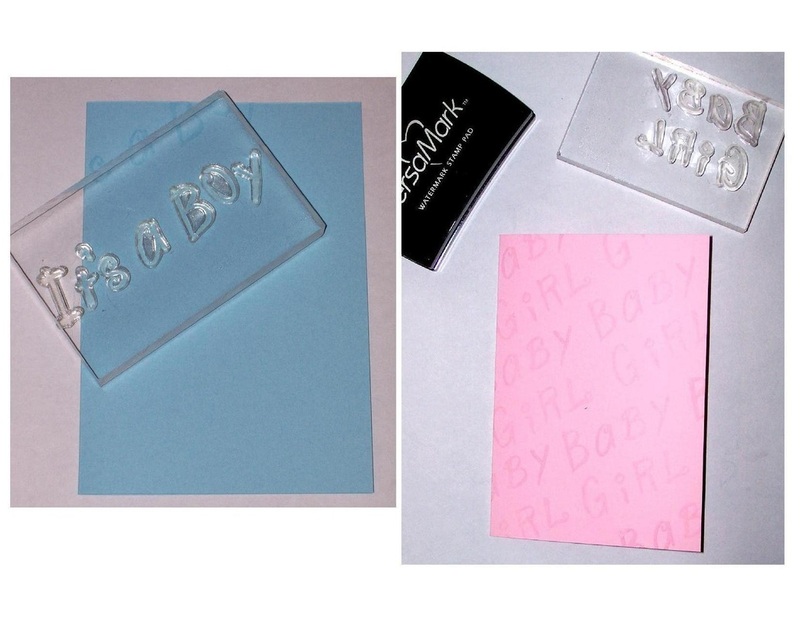 I used my alphabet stamps to make the words "It's a boy" for the blue cards, and "Baby Girl" for the pink card. 5. 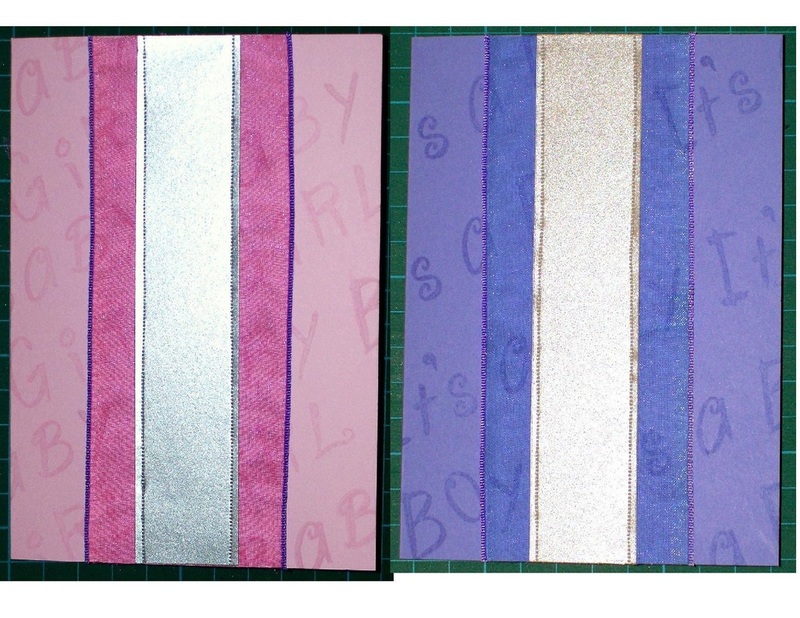 Attach the wide ribbon vertically to the centre of the card, overlapping it from the ends of the card. These will be trimmed later. Hint - Use double-sided tape, but if you use see-through ribbon like I have, make sure that you place the tape in the central part of the ribbon where the strip of silver paper will hide it, otherwise it well be seen through the ribbon and spoil the final appearance of your card. 6. If you would like to, run a punch wheel down each side of the strip of silver paper. Place the cork board underneath for best results. This adds a stiched appearance to the edges of the silver paper strip. 7. Adhere the strip of silver paper to the centre of the large ribbon, overlapping the edges again. 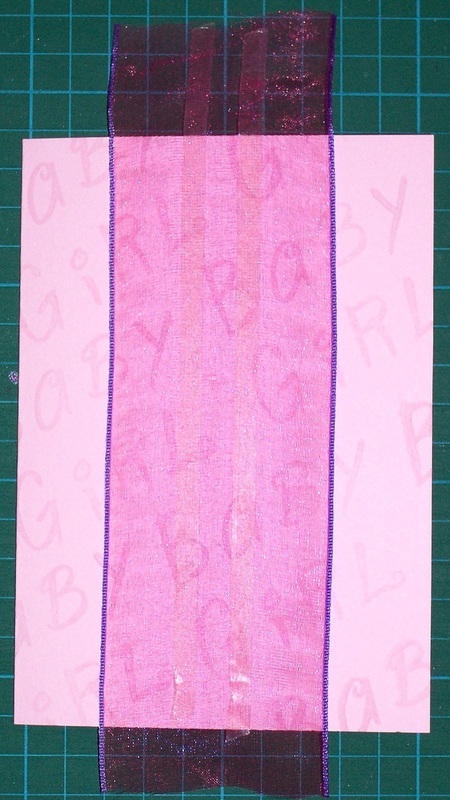 Trim the edges of the ribbon and paper to level to the card edges. 8. 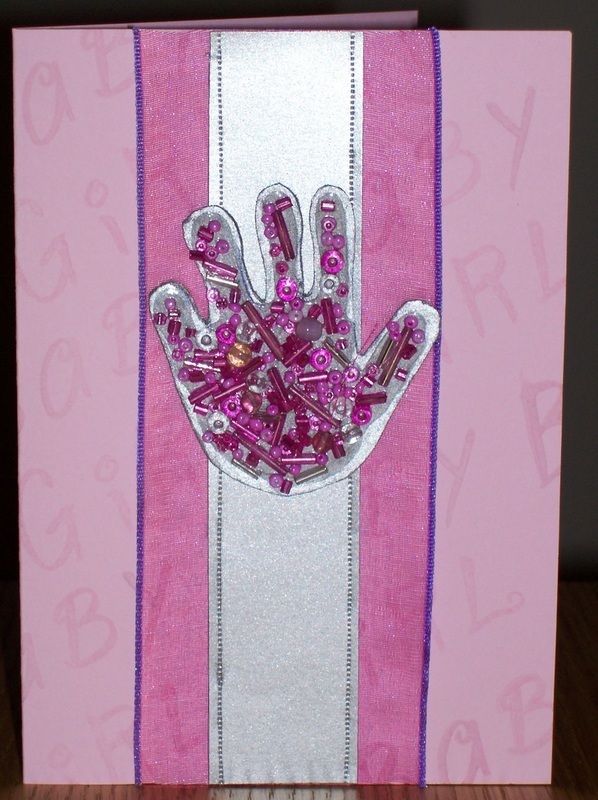 Once the glue is dry, adhere the beaded hand onto the card, over the ribbon.